Nicole Oliver loved running, grew up running and was pretty competitive during her high school days at Williamsville South and in local road races. But life happens, including being diagnosed with dystonia at age 20. The condition is a movement disorder in which muscles contract involuntarily. As she sought the treatment that worked best for her, running became a challenge both physically and mentally. Her times got slower and her performance didn’t match what she so desired to do. Oliver lost her motivation. She started telling people she didn’t run anymore. Finally, her husband, Nate, initiated the difficult conversation to get Nicole running again. See, Oliver might not have been up to her speed standards, but she still could go out and whip out a long run of 10 or 12 miles. She might not feel that great after it, but it wouldn’t faze her. She had a talent for running, even if that talent wasn’t about crossing the finish line before everyone else. So yes, she could still run. She would still run. She decided to train for a marathon and settled on the Niagara Falls International Marathon in late October. But in order to keep her motivation, in order to give her perspective and rekindle the joy, Oliver needed to find a bigger reason to run. She started researching charities and settled on the Companions in Courage Foundation, founded by former Buffalo Sabre Pat LaFontaine. The charity connects hospitalized children with their family, friends and heroes, by building interactive playrooms in hospitals. Kids get to be kids, at least for a little while, during battles with illness and disease. Oliver created a Facebook Page, Nicole Runs for A Purpose, to share her training while raising money for Companions in Courage and spreading its message. The task not only brought her joy, but helped her reconnect with her own childhood, including asking her mom to dig out the LaFontaine poster that hung in her room when she was in fourth grade. Her whole attitude toward running shifted. She found joy in running for people other than herself. It even helped her when she suffered a groin injury 12 weeks into training. 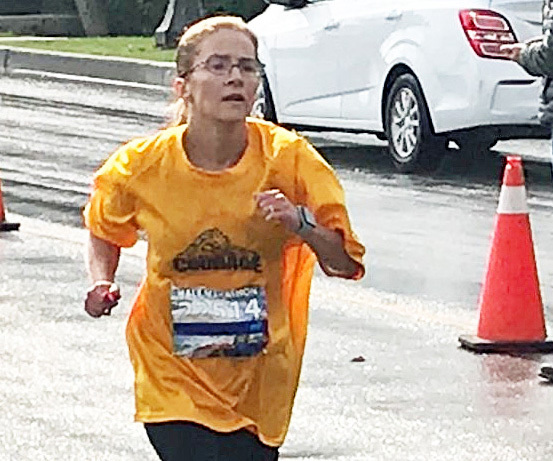 She had to take time off and decided to bump down from the marathon to the half-marathon — a distance she had run many times in training but never raced. She knocked out the half-marathon and claimed her first 13.1-mile distance medal, finishing the race on Oct. 14 in 1:54:42. “My whole perspective on running has changed,” Oliver said. “There’s this certain joy and happiness you can find from endurance training and racing where it’s not about you and not about your times. Having a goal in mind is great, but when you think about helping people less fortunate than you, it’s just I can’t put it into words. I felt like I had run the best race of my life. It certainly was not the fastest, but I crossed that finish line and felt like this has been the best race so far.